Check out what Earthcalm's customers have to say about their products. Customer testimonials & product reviews demonstrate the overwhelmingly positive impact of EarthCalm EMF Protection Products on health & well-being. I have tried many products that claimed to protect from EMF, including Q-link and Tesla plates. EarthCalm is the only one that really convinced me of its technology to protect humans from harm of radio frequency. The moment I plugged the Home EMF Protection System (HPS) into the walls, I sensed the body started to ground deeper into the earth and my legs become stronger. When Nova Resonator was first introduced to me, my sacrum became stronger when I simply hold it in my hand. My body also felt more calm than when I was not wearing it. I did not know the body was in a subtle stress even when I simply carried the mobile phone with me in my bag, and not having any conversation over the cellphone. On the day when I purchased the Quantum Cell, I was wondering why my body felt a lot more calmer than usual, until I figured out I just pasted the Quantum Cell on my iPhone. I suffered from chronic backache for many years. I spent thousands after thousands of dollars in chiropractic treatment, many forms of massage techniques and energy work. My room, being on the top floor, is facing a cell tower that is less than 50m away. My room was actually shielded from the cell tower with fabric that is of the highest shielding power in the market. So my family members and I are actually very safe despite the nearby cell tower. Yet the first time when I used Lunar Shield, I felt the spine started to relax vertebra by vertebra. The next morning when I got up, much of the back ache was gone. In the daytime, because of the stress in work, the backache came back. But the pain was less than before. This showed that the EarthCalm technology and its products are more than EMF protection tools. They are also healing tools that help the body recover from damage not only from EMF but also emotional and mental stress in life. Many people are living in a state of stress that they do not know. The physical body actually perceive the radio frequency as invaders when they reach human auric field. Imagine the cells in the body repeatedly receive message that someone is attacking them! This stressed and weakened the body. HPS, Nova Resonator, or lunar shield actually gave the body a message of safety. The cells are live and cannot be deceived. Like animals flee before an earthquake happens, the cells in the body do not reason but respond and react to the real situation. The souls anchor at where they feel safe. That's why people who are sensitive to the senses of the body feel calmer when the technology for EMF protection really works. My child and I use all the products of EarthCalm. I began to feel tingling sensations on my face and body while working at the airport. What follows is a series of unexplained heart palpitations and anxiety in which I was hospitalised as the doctor suspected a mild stroke. I went through numerous X-Rays and even MRI but doctors could not find anything wrong with me except to diagnose me with anxiety disorder. A year or so later, the symptoms as stated has not subsided as it comes and goes. Then I decided to change my mobile phone and this led me to discover that I was actually sensitive to EMFs. After a phone conversation I began to feel a crippling brainfog that made me being unable to focus at work and think straight, remembering things began to be difficult. Maybe this brand of mobile phone emits so much EMFs that i was experiencing this I figured. If this was bad, things got worse when I began to "react" or rather the feeling of being pulled to whichever mobile phone that was ringing and imagine in a public registry office where I am working there are so many mobile phones! I began to stay away from people and public places as I was resonating to the EMFs which causes my body especially my chest area to vibrate and it was unnatural and very uncomfortable. I began to Google the symptoms I am experiencing and it led me to Earthcalm. I contacted them and I was told that there was an authorised distributor here in Singapore! I was both ecstatic and desperate to try out the products and willing to do anything to rid myself of these unpleasant symptoms so I contacted Jeff Yeo. I set up an appointment with him at his residence. The second I stepped into his home I instantly felt a sense of relief and calm. Jeff then explained to me that I was being grounded to the natural healing fields of the Earth and this is what Earthcalm products is all about. I got started with the Nova Resonator and when I put it on I instantly felt so good as if my feet was being pulled to the ground and I began to feel calm, relaxed and just so relieved! I was so thankful I had found Earthcalm. Gradually my body began detoxing itself and recover. Soon enough I got the Home EMF Protection System, the Quantum Cell and Omega WiFi. All of them crucial for me as each of them is unique as they tackle the different EMFs that are emitted from the different devices that are present around us. The wifi router is indeed my worst enemy after the handphone as it was on the whole night and I could not sleep, not to mention the whole HDB block has wifi routers in them! Whenever I was on the verge of slumber my body felt an electric shock waking me up again. It was depressing so thank God for the omega wifi. No more brainfog thanks to the quantum cell. Thank you Earthcalm and my heartfelt appreciation and gratitude to Jeff! I started using EarthCalm products in mid-2014, because I found myself experiencing headaches, brain fog, colds and insomnia on a regular basis after installing WiFi in my bedroom. EarthCalm products are very powerful. Being the impatient sort, I plugged in the Home EMF Protection System at full capacity while also wearing the Nova anklet. Because the technology reduces EMF loads significantly, the body now has the ability to start moving toxins of all sorts out of the system really fast, and I experienced uncomfortable symptoms. So I slowed down and gradually increased the power of the home protection system over the course of one month. I may not be able to tell you accurately enough the tremendous difference EarthCalm products have made in my life because this new high level of functioning is now my normal. But there was once when I was outside the home and started experiencing the kind of persistent low grade headache I experienced pre-EarthCalm. I realised that I wasn't wearing my EarthCalm anklet. The moment I reached home, I put on the anklet and within minutes I felt normal again. It occurred to me that before using EarthCalm, that low grade headache had always been with me. I just did not realise it because my resilient body helped me tolerate it and just does its best to keep me going no matter what environmental stresses it was subjected to. Since then I have never taken off my anklet and I recently added on the Sanctuary Bracelet. The bracelet helped me to achieve an even higher level of mental focus and a feeling of solid strength in my body. If you want to achieve a sense of physical ease in the body, calm and mental clarity that is the natural state for all of us, I urge you to try EarthCalm. The EarthCalm products will build a solid foundation of physical and mental resilience from which you can soar to greater heights of happiness and success. I recently received the Resonator Pendant, and I will say, that this is the smoothest, and deepest energy I have felt so far from any of the products.There is a depth that seems to have no end, and that would make sense, since these energies tap into the earth’s energy, which is boundless. The other products seemed to give a sense of relief, but with no ‘direction’ in that they gave some alleviation of agitation, but then a sense of blankness, and the rest was up to me. Your products, from what I am experiencing so far, have structure, direction, and boundless capacity, since they are based on harmonics, and universal algorithms that are based on the evolution of the earth. As far as I can tell, your products are unique in the regard that they have been tested with direct experience, as well as universal and earth based scalar information, and the other products alleviate, or block things, but don’t give dimension, patterns, or direction. I now sleep much sounder, the brain fog is almost gone completely, and zero headaches, no colds, etc. Your products do work, and I can feel them work every day. I just want to thank you for saving my health! I was very sick for almost a year. Symptoms included severe anxiety, dizziness, panic attacks, etc. I honestly thought I was losing my mind. My doctor prescribed sedatives but they only helped a little. Then I went to a psychologist and he treated me for almost a year with barely any positive long lasting results. Then one day, I received a call from my sister. We spoke for 90 minutes and I was using my cordless phone. I felt fine before she called. When I hung up, Ialmost blacked out. That’s when I started researching the topic of EMF toxicity. My psychologist lent me his triefield meter and I found out exactly what was happening. After some needed changes at home and the purchase of your products, I haven’t felt this well in so long. Thank you for helping me get my health back! I was a total skeptic about all this EMF protection hype. Until I tried it . I quit having chronic headaches! (A very big deal for me.) And I wasn’t tired and fuzz-headed after a few hours at the computer. No, I don’t know the science behind it, and I don’t really care. It works for me. If it didn’t, I could have returned it for a full refund. I called EarthCalm to ask questions, talked to a real person who was very helpful, without a big sales push. I’d recommend this company to anybody open-minded enough to try it for themselves. I am so electro-sensitive that I don’t need a meter of any kind to test your products, because I feel energetic shifts immediately. If I’m in the front yard I can tell when someone in the house hangs up from a cell phone call, so I am an EMF meter myself. After 17 years of being electro-sensitive, I have recently been having up to 10 seizures a day and have fought going unconscious a number of times in the last several weeks. Upon waking I’ve felt like anelectrical barbed wire fence was inside of me, due to the EMF’s that were trapped in my body. I am also a Reiki Master and have studied other forms of natural healing, including Healing Touch, nutrition, EFT and TFT. So I’ve tried those in addition to acupuncture, orgonite and orgonium products, scalar energy pendants, a zero point energy wand, crystal healing, a BioDisk from a quantum physicist and anything out there I could find. I have seen highly respected practitioners in various areas of natural healing, but no one I’ve tried understands electromagnetic sensitivity the way you do, and their methods usually caused me to get worse due to the detox, or possibly feel better for a day. When I put the Quantum Cell on my phone, I found that the radiation is actually transformed into beneficial energy which surrounds me like a cocoon. (For over a month I haven’t been able to be around cell phones even when they’re OFF.) I have also found that there is no more harmful radiation coming from my computer because of the Omega WiFi, and the energy coming from it is now feels like a beneficial field too. (I can now finish my online education in holistic health, thanks to the Omega WiFi!) Also I have been unable to work properly for over a month, but I just notified an employer that I can resume work. The Traditional Resonator does what your website says it will do (it’s also much prettier than it looks on the website). Last night I took the Resonator off when I went to bed, because I didn’t want to overdo it. I know you recommend using the home system first, but I couldn’t tolerate being out of the house without it, so I’m already using the pendant. For 15 minutes after removing it I had a series of strong heart palpitations, which has been happening over the last 3 years, but it’s unusual for me to have so many in a row. I felt horrible and put the pendant back on, and have felt much better ever since. I will never remove it again! And the Home EMF Protection System is phenomenal. Until now, I have been getting dressed in the dark and fleeing the house each morning without even being able to properly check myself in the mirror, sick from the EMF’s in the house. I just plugged this system in and walked into every room here, and every room feels completely cleared of harmful energy. Thank you EarthCalm, you have saved me from being cooked. Life without you has been unbearable. EMF’s were causing me to harm myself uncontrollably on a daily basis. (The electricity has been overpowering the electrical signals in my brain, and literally taking over.) Each day for the past month I have felt I couldn’t face another day. 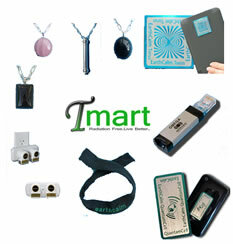 Finally, a line of EMF products that deliver, from people who understand electromagnetic sensitivity! I have had no asthma all day, no headache and most of all…it is miraculous…no sinus congestion of any kind. It has been years since I have been able to breathe properly. Thank you for your amazing products. They all work like a miracle. I am so glad I found out about your cure for hypersensitivity. I work in an IT department. At some point, I thought I had to quit my job. I was in the emergency room twice. I am still sensitive even wearing the pendant, but not to the point where I think I am losing my mind. The Home System for the house is my favorite. My house has become the most safe place on Earth for me. I cannot say enough great things about your products. I’m sure you’ve heard this before, but they have changed my life. I had many health issues just pop up over a 6-12 month period and all from Wi Fi. I purchased a new laptop and developed vulvodynia, high blood pressure and gained weight. I purchased your home system, the necklace and the one for my laptop. It might be overkill, but I trade the stock market, so I need to spend time in front of my laptop. Before finding your products, I had to stop trading–the vulvodynia pain would start in a matter of minutes after being exposed to the Wi Fi from my laptop. Given the electromagnetic chaos we live in today…the technology behind this type of product is one of the most important endeavors there could be now and in coming years. I must say a hundred times over that I am so grateful for this saving grace. I have only had the Quantum Cell for about a month but in that month I have had REMARKABLE results. I would like to share a little bit of history with you and my testimony of how amazing this product really is. For the past fifteen or so years I have been dealing with debilitating headaches. Over the past few years I have had several CT scans, which provided no answers, and more medication than I can name, all of which had no impact on the pain. Eventually, I ended up on a narcotic/sedative that after several pills would start to alleviate the pain. However, after adjusting to the medication, which took about a year, the FDA pulled the product with mo explanation as to why… Then again I’m not sure I want to know. Needless to say, it left me to start over as a guinea pig for the pharmaceutical companies. About a month ago, my mother had the opportunity to obtain a Quantum Cell, which she gave me for a belated birthday present. When I first received it I was skeptical to say the least and wasn’t exactly impressed with the idea. But still I figured it couldn’t hurt to try, I was opened for anything that might help. Now 1 month later I have been ABSOLUTELY, 100% FREE FROM HEADACHES! NEVER in my wildest dreams could I have imagined that anything could work so drastically and in such a short amount of time. Amongst this I have also noticed that other symptoms have been alleviated. In 2010, I was diagnosed with Bells Palsy. After recovering from it I was still having residual effects. I have noticed that in the past month I have had NO symptoms if the after effects of this disorder. Thank you EarthCalm. Your Quantum Cell has saved my life! I have been freed from taking any medications for headaches or Bells Palsy. I used to have a slight headache after talking on my cell phone. I notice now with the Quantum Cell, that headache is completely gone. Amazing. I am a true believer in the Quantum Cell and Home Protection System. I first heard about the products from my sister. The house I was previously living in had a Smart Meter right on the other side of my bedroom wall. I was waking up every morning with a headache. Since I’ve installed the Home EMF Protection System I no longer experience daily headaches. I also have the quantum Cell device on my cell phone, which I keep on me at all times. I do this because one day I went to town without my cell phone, (that won’t happen again.) While in town I stated getting a headache and just figured it was from the stress of driving in a heavy traffic and shopping in really crowded stores. But when I got home and settled down from a day out I noticed my headache was gone. So as not to assume this was just stress, I repeated going out without my cellphone 2 more times and each time within 10 minutes my headache would return. Then as soon as I was home it would go away again. I also repeated this experiment with my cell phone on me–no headache. My conclusion was the cell phone protection did make a difference when I was away from the house. I now carry it with me at all times. My next product will be the Nova Resonator Pendant. I am very electro-sensitive. I feel EMF exposure instantly and start to feel uncomfortable and depressed when I’m around Wi-Fi. Plugging in theOmega WiFi and putting the Quantum Cell on my phone felt wonderful– I started to feel more relaxed, and my sleep was great. I woke up feeling I was out in the countryside when I’m actually in the middle of a city centre polluted with WiFi. My personal experience with the Home EMF Protection System: Moments after I plugged the device into one of the outlets in my home, I felt myself breathing more deeply than I had been – a sense of my lungs and entire ribcage area opening, as though some long-held tension had just been released. With this came a sweet feeling of contentment, ease and happiness. I smiled, within a feeling that “yes, this is a good thing.” Since I’m already relatively healthy, I progressed fairly quickly through the three stages – designed to gently and gradually acclimate the nervous system to its new and healthier electromagnetic environment. After several months, it was time for me to either send the Home EMF Protection System device back to EarthCalm, or to actually purchase it. Since I was feeling a bit pinched for cash, I decided to send it back. The moment that I pulled in out of its electrical socket, I could feel an increase in nervous-system agitation. By later that evening (after I had already gone to the post office, to send it off), the nervous-system agitation had increased to a very uncomfortable level, and it took me nearly three hours to fall asleep (vs. my usual 15-30 minutes). As I was lying there in bed, my eyes wide open, I also noticed that I had a low-grade headache, a low-grade sore throat, a bit of nasal discharge, and a distinct feeling of constriction in my chest, with each breath. The next morning, I woke up still feeling fatigued and agitated, and noticed in addition a low-level aching in my joints. Well, suffice it to say that it took me less than 48 hours to order a new Home Protection System — and plan to have it as an ongoing fixture in my living-space, for as long as possible! Well Jean, all that instantly stopped 10 to 15 minutes after I plugged in my Home Protection System. At first I asked myself: Is this psychosomatic? But 2 to 3 hours later I knew it was for real. During the initial hour I felt as if someone had put a veil over the gray matter between my ears. Not that I was unable to get any work done, even so I felt somewhat phlegmatic. As a matter of fact I accomplished quite a lot. During the next couple of hours, that veil dissipated, and I suddenly felt totally at peace. I was overcome by a feeling of immense happiness. Not that I am a morbid person to begin with, it was just such an elated state of being, that I said to myself: This is totally “nuts”. Before hearing about EarthCalm products, I had been dealing with symptoms of fibromyalgia for many years: exhaustion, weakness, broken sleep, digestive disorders, mind-fog, muscle and joint pain. To a certain extent, I had learned to live with these symptoms through the help of a strict diet, taking many supplements and drugs, and going through numerous health programs. And yet, nothing completely alleviated my symptoms – especially my lack of energy and sense of weakness. I was unable to work more than 2-3 hours a day, and I was usually mind-fogged when I did. I always needed a nap in the late afternoon. If I could get 3-4 hours of unbroken sleep at night, I was ecstatic. I had tried so many things over the years to try to improve my health, and I really didn’t think that protecting myself from EMFs was going to do a whole lot for me. But I decided I might as well try it. Well, I was amazed. After just plugging in the first plug of the Home Protection System, for the first time in probably 30 years, I actually slept for 7 hours straight! I woke up feeling refreshed, without a headache, alert and ready to meet my day. Since then, my energy has increased to such an extent that I can now easily work 8 hours a day and I don’t need a nap. I am able to multi-task for the first time in years; my brain feels clear and alert. I am so happy to have discovered the EMF piece of my health puzzle. I can now say that I finally feel like I am recovering from fibromyalgia – something I never imagined I could say. My 11-year-old dog had a large growth removed from her leg a year ago. After the surgery, she developed a limp and became very lethargic. I got a Home Protection System for myself and wasn’t thinking about my dog or that it might have any effect on her. But a couple of weeks after I plugged it in, I noticed that her spirits seemed greatly improved–she seemed eager to go out and explore again and wanted to play. And I also noticed that she was no longer limping. I experience headaches, nausea and trouble concentrating when surrounded by EMFs. At work I’m surrounded by 200+ computers and my desk is less than 100 feet from a cell phone tower. I have tried different devices, but have only found one that works. I now use a home protection system by EarthCalm. I gradually added each piece of the system at 2 week intervals. Once I finally got to the full system, I noticed a fast improvement in my health. Since I could only afford one home protection system , I take the unit from home to work with me every day. I’m amazed that after years of being sick, I actually feel good now! I would recommend anyone having a sensitivity to EMF’s to give one of EarthCalm’s products a try. I had cataract surgery a year and a half ago and my right eye developed scar tissue over the lens. It caused me to be practically blind in that eye as far as being able to read was concerned. Everything was blurry and I had to constantly squint. I couldn’t afford the surgery to go back and have it corrected though and had to just live with it. I work on a computer all day and had to get readers to be able to see. After just 2-3 weeks of plugging in the first stage, I no longer needed my glasses! My vision is getting better and better all the time. Thank-you so much. So far it is a feeling of well being. I can say that the Home Protection Unit did lower my blood pressure and pulse when I got the second plug in. I no longer have panic attacks; so I was able to slash my beta blocker medicine in half and still have 118-60 and lower, with 75 pulse rate. Before the Home Protection Unit, my blood pressure with full medication was 120-140 over 75-85 with 80-85 pulse rate. I am no longer looking for a chair after I bend over to pick up something or exert myself for some reason. I find myself getting up from a chair without thinking about it before hand – just automatically doing it. Ino longer dread getting out of bed or walking down the hall. I assume that I will soon be able to discontinue the high blood pressure medicine completely. As for my daughter, within just a few weeks, and especially after she started wearing the Scalar Resonator, her grades turned around and she found renewed enthusiasm for her schoolwork. All of her grades were brought up to either and “As” and “Bs” from “Fs” and she made a decision about what to do for her career! I do believe that her lack of concentration was due to the fact that her school has a cell phone tower right on the premises. At 2:30 on a Saturday afternoon, I plugged in my Home Protection System and sat down at the kitchen table to make a grocery list. I wasn’t expecting anything, but literally within minutes, I felt the pain begin to drain out of my body. The tension I didn’t even realize I was feeling, started to leave. When you live with a condition long enough, you don’t remember what “normal” feels like. For years, I hadn’t been comfortable in my own body. I always felt like I was going to fly out of my skin. I felt like crying all the time. I felt absolutely hopeless. I can’t begin to tell you what a relief it was to feel the pain, the depression, the anxiety and nervousness, the mental fog just being drawn downward out of my mind and body. I could breathe again. I didn’t feel like crying. The pain was at least 65% better. My eyes didn’t burn and hurt and water. I just sat there in total amazement as this happened to me. Within a half hour, both of my dogs got up and began to play like two year old Poodles. They raced around the house, played tug of war with toys, ran up and down the stairs happy as could be. They had been acting like little old men before the Earth Calm Home Protection System was installed. Jean, I don’t pretend to understand how your products work. All I know is that, after all these years of suffering and being afraid of the future and feeling like I was going to die, your products have given me my life back!!!!!! That’s how well they work when up against a huge cell phone mast 250 feet away. Think what they can do for the average home! Presently, in my home I have Scalar Home Protection System engaged at the first two levels. The first day my sinuses drained, and the right ear (which is the cell phone ear and is pierced) drained for 12 hours. I feel it working through my body ..which I would describe as detox. I had itchy areas — hooray!! Things are changing and I experience it as wonderful!! I totally enjoy my Atlas Band Hat — it is just the first hour and my head feels warmth. I know this sounds like I’m TOO HAPPY. It is simple – it quiets the atmosphere with calm. And lets my mind enjoy my true origin – that is harmony. The EarthCalm equipment has been a very big help to me in living a more satisfying life. With a medical diagnosis of schizo-affective disorder about ten years back, I was not in the best of shape mentally. Using EarthCalm equipment has helped me to eliminate my formerly frequent bouts of anxiety, my thinking is much clearer and I have a substantially deeper feeling of the presence of Myself which has helped me to feel calm, peaceful, and centeredmuch more of the time. Your new Nova Scalar Resonator is a prize! Within seconds of putting it on, I felt tingling in my hands and my face flushed as I began to feel a deep internal release of tension. Although I was in a busy environment, a calm, quiet space seemed to extend around me that ended the background zing and buzz I’d thought was normal! My mind was clear, focused, awake, and I felt very present and deeply happy. I received the new Nova Scalar Resonator this morning–and I could feel the warm, tingly sensation mentioned on the website right away. I feel so muchmore energy and positivity from wearing it. Your products are always great and I can always tell the difference immediately. I received my ankle bracelet yesterday. I felt like a kid at Christmas when I got my mail. I’ve been walking with a limp at times from a broken ankle years ago but when I put my ankle bracelet on the pain is almost gone. Now I can start my yoga practice again. As a practitioner, I am always on the lookout for tools to help my clients. Through biofeedback testing called ‘Autonomic Response Testing’, many of these clients present with various forms of radiation sensitivities that are significantly disturbing their nervous system and in turn their ability to reach their health goals. I am thrilled to see such clinical success with the EarthCalm products (and this after having tried many, many others). Many clients have shared that they feel an immediate sense of calmness when they begin to wear the pendant. Others say that the ‘inner buzzing’ sensation has stopped. Electrosmog is fast becoming a real health concern. We are fortunate to now have a company that not only foresaw the electrosmog connection to illness, but has created high quality products to remedy these interferences! l just want you to know what an honor and privilege it is to represent EarthCalm at the Expos across the country. * l feel that by selling EarthCalm products, I am helping to change the lives of the people I touch, making a huge difference in the quality of their lives. l get to witness miracle after miracle on a regular basis. Anytime a person has a healing, it makes me feel so happy that in some small way l was part of it by introducing the amazing products that you have invented. l don’t know if you are aware of this but l have asthma and have not had to use my inhaler in the 8 years that l have been wearing the Scalar Resonator. l have many things to be thankful for but being introduced to you has changed my life immeasurably. I purchased the Earthcalm product with curiosity as well as some resistance on my part. It is lovely to wear so I decided – why not? And, if it could help me - that would be a bonus. Another wonderful thing happened. I am one of those people who attracts every bug there is. They seem to love biting me and each summer I dread the spider, gnats, flies, and anything else that thinks I’m “delicious.” These bites are so bad that I naturally scratch or rub so hard that I have bruises on my body. I noticed, accidentally, that on the fourth day of wearing this lovely piece of jewelry, I have not experienced bug bites. The bugs are actually leaving me alone and I’ve had a good night sleep as a result. This may sound small and insignificant but for me it’s HUGE! The protection from the radar in combination with the EarthCalm pendant began a period of rapidly increasing health. Without the protection from radar, the gains from the EarthCalm pendant would have been lost and my health would not have improved. But because I was protected most of the time at work,I was making rapid gains in my health with the help of the EarthCalm pendant. You may be wondering why the EarthCalm pendant worked for me and the other devices I tried previously did not help much. The answer seems to be thatEarthCalm devices ground the body into the Earth’s electromagnetic field, and the other devices I tried did not do that. Because man-made electromagnetic radiation is extremely high in comparison to the natural levels (Robert Becker claims that it is at least 100 million to 200 million times the natural level), the Earth’s magnetic field is almost completely overwhelmed and lost in the noise of EMF pollution. This is extremely significant because the body cannot operate optimally unless it is “tuned in” to the Earth’s electromagnetic field. When I started wearing the EarthCalm pendant, my life force was greatly stimulated because my body was again able to use the Earth’s electromagnetic field to normalize the functions within the body. My fibromyalgia is not nearly like it was, my energy has returned. The headaches I still get but NOT with the frequency I was and I don’t take really anything for my headaches. Where I was getting 6 or more a month now I only get maybe 2 or 3 tops and they are not as debilitating when I do get them. Picked up my resonators yesterday and immediately ran around installing etc. Coincidentaly, it was my tai chi and qigong day and I asked my Chinese tai chi master to wear my scalar resonator for a few minutes. He said he felt chi going down into the sacral chakra and beginning to rise at the rear. “Veli good.” He said he could buy it and to lend it to him for a longer time to assess. With the Qlink a few months back, he just said he felt “something”. Yesterday he even recalled that I had brought the Qlink to him to check…he remarked that “this one better than last one”! So, there you go. I might have to put in another order sooner rather than later. I found that my posture corrected itself! Lately I’ve been troubled to note that I am hunching over slightly, and it’s been an effort to straighten up. With the (Scalar) Resonator on, I stand straight naturally without thinking about it. I live on the 18th story of a highrise in downtown Chicago. Since moving in, I have had terrible difficulty getting to sleep at night. I have accounted it to the 20-plus wifi networks coming thru my apartment from other units and it did not make much of a difference whether my router was on or off. One week ago, I installed the Omega WiFi into my router and immediately felt a significant shift in the energetic space of my home. It feels much quieter and more contained, and getting to sleep at night is ten times easier. I am so relieved! I was feeling so headachy all the time, ever since we plugged in our wireless router. We really need it because my husband and I both work from home and our offices are on different floors. My husband felt dizzy a lot and had to take naps in the afternoon. I was skeptical about your Omega WiFi. I didn’t even tell my husband I was buying it, because I knew he wouldn’t believe it would do anything. Well, almost as soon as I plugged it in, I was aware suddenly that my chronic headache was gone. I was amazed! It was like I had entered into a whole new zone or dimension. My head was clear. My husband didn’t notice anything until the next day. But then he said, “Honey, what did you put in the coffee? I feel great today—wide awake.” I just laughed and showed him the Omega WiFi. I’d like to start by thanking you so much for the Omega WiFi. I wasn’t completely sure what to expect when I first plugged it in, but I was immediatelystruck with a powerful grounding sensation, as if a new gravity had entered the room. As the days have gone by, I’ve noticed myself feeling more centered, focused, and less hyperactive than I have in many years–in a word, happier. Your product has caused me to realize that having WiFi in my home for the last decade has significantly diminished my well-being. It seems like such a no-brainer that a radio signal carrying microwave radiation throughout a person’s home would do that, but I guess when your brain is literally being microwaved each day, common sense can elude you. I’m a postal employee and often suffer with leg cramps after a long day of walking on my job. Since wearing the Photon Band, I have had no leg cramps–and also, my endurance is up. After I received my photon band, I placed it on my arm to hopefully alleviate tendonitis and swelling caused by lymph node removal. Wow! I couldn’t believe the pain relief, and it just keeps getting better! The swelling has reduced, and the pain has greatly decreased. I’m so thrilled with the results that I have ordered three more. Thank you so much for this awesome product! I used to not be able to walk into stores that had WiFi–I’d immediately get a sharp headache and a feeling of dizziness. Now with the Photon Band, that doesn’t happen! I can shop with comfort and not have to rush. Several days before receiving the EarthCalm Photon Band, I had planted several rose bushes. I knew my knee would be sore from the work. The next day, I received the band and placed it on my ankle. Almost immediately, I felt a warm sensation in the knee area. I wore it to bed and the next morning, I had no pain to speak of.